I'm really not kidding about the "easy to make" part. The whole Sbrisolona Crumble Cookie Tart can be put together in a food processor in a few minutes, then pressed into a pan and baked. Done. In years gone by, in it's original city of Mantua, Italy, this was known as a "Tart of Three Cups". It used 1 cup of Corn Meal, 1 cup of Wheat Flour and 1 cup of sugar. The name comes from the Italian word, Sbriciolare - to crumble. Along the way it has been tweaked by many, including ShowFood Chef. The wonderful part of the Sbrisolona that has not been changed, even by the finest pastry chefs, is the crumbly nature and spirit of friendship. This cookie tart is to be broken in pieces and shared by friends and family. Sure, you can slice it- but why bother. It's so fun to break off a piece and pass it along without ever having to stop your chatting. Okay, maybe that last part was just about me. 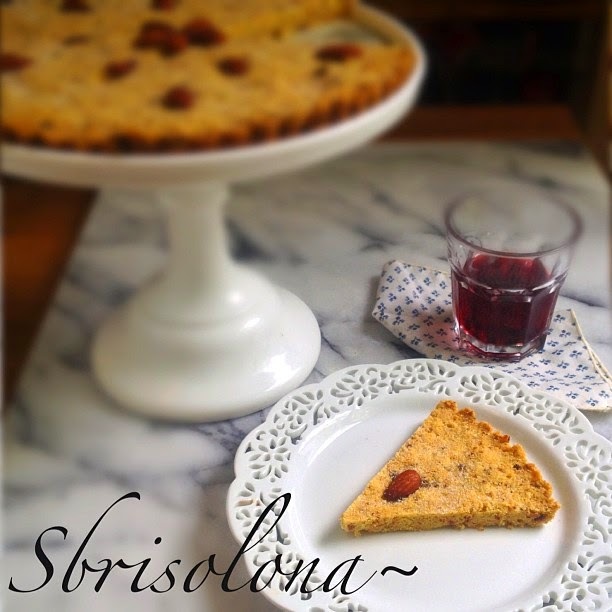 Sbrisolona is perfect with tea or coffee in the morning, afternoon or even as a late night "under a book light with a glass of wine" snack. Yeah, that last part was definitely about me. 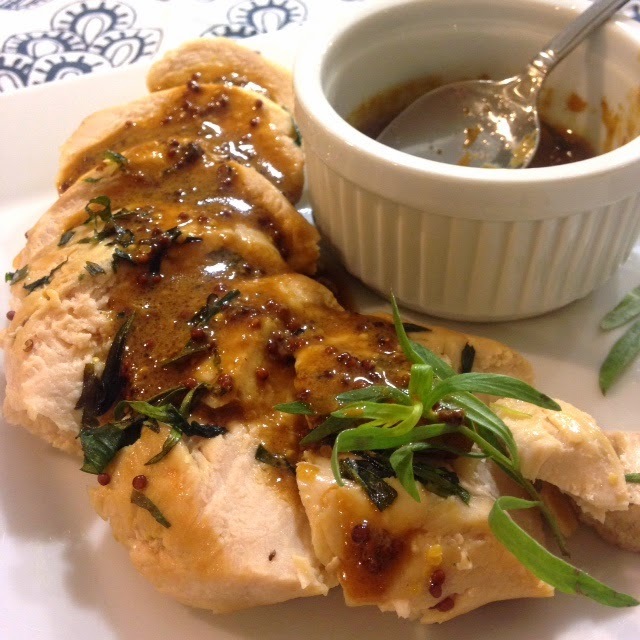 Last note: As good as it taste fresh out of the oven, the flavors and texture are even better the next day. SBRISOLONA (Crumbly) Italian Cookie Tart: Traditionally this is shared with friends who break pieces off to eat with tea or wine. 1) In a food processor, add Flour, Corn meal, sugar and zest- pulse 10 times. 3) Add almonds, walnuts and Cheeries - pulse about 5 times. 6) Bake in preheated 350f for 15 mins, then reduce to 300f for about 10-15 more mins. “I Love You” is to just say it. You can create your own chocolates with a few steps that are so easy, even a toddler will enjoy making a family treat. ...or as evolved and inventive as you prefer. In fact, why not make a party of the whole event? preferably a very good quality with high cacao and less sugar content. shredded coconut, dried fruit pieces, nuts, pretzel pieces, candied fruits, pine nuts, pepitas, salt crystals, flavored sugars, broken candy pieces, organic edible herbs and flowers, etc. 1) Gently melt the chocolate your favorite way: double boiler, microwave slowly, etc. 2) Spoon small dollops onto a parchment or silicon covered baking or cookie sheet pan. Use the spoon to create other shapes if you like, ie. a heart. 3) Sprinkle your toppings as desired, but leave mostly chocolate showing. If life is like a box of chocolates, why not create your own choices! Do you walk by the Seafood section of your grocery store with only a glance at the whole fish on display? Is it because you're not sure what to do with a fish that feels like it's looking back at you? Are you just a little bit intimidated by the idea of cooking it, or even what to ask for when it comes to fresh fish? If so, this is a great beginner's recipe. I'll tell you what to say, and then within a few simple steps you'll be serving WOW on a plate to your friends and family. If you have hooked, scaled and smoked your own catch - you may still enjoy a reminder of how "simple" can mean delicious. 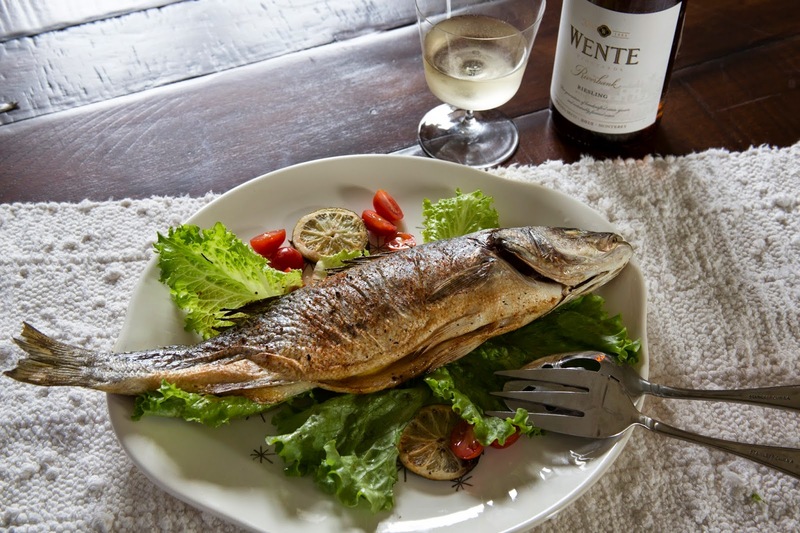 Branzino - pronounced "Brahn-zee-no" is a seabass frequently caught along northern Italian shores in warmer weather. When caught or farmed in other areas, it's called European bass. In Spain, it's called Lupina. It's Mediterranean and when cooked in that style with additions like capers, lemons, tomatoes and olives the flavors turn the simple into the exotic. A whole roasting pan lined up with Branzini (plural in Italian for Branzino) can be very impressive, but it also makes a nice quiet dinner for two when you roast just one. 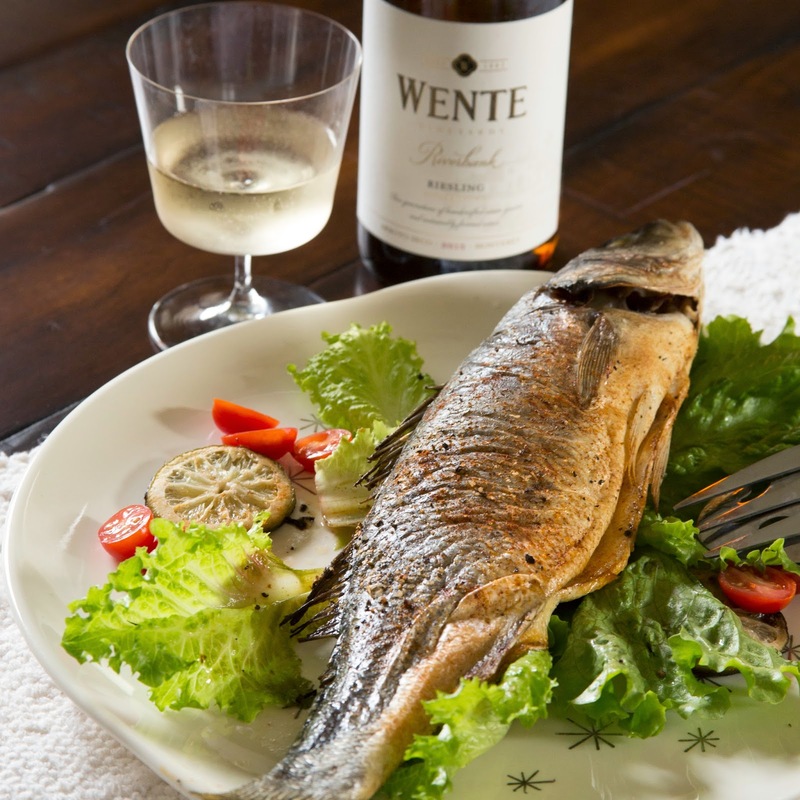 Riesling white wine - Wente makes a crisp, excellent Riesling. 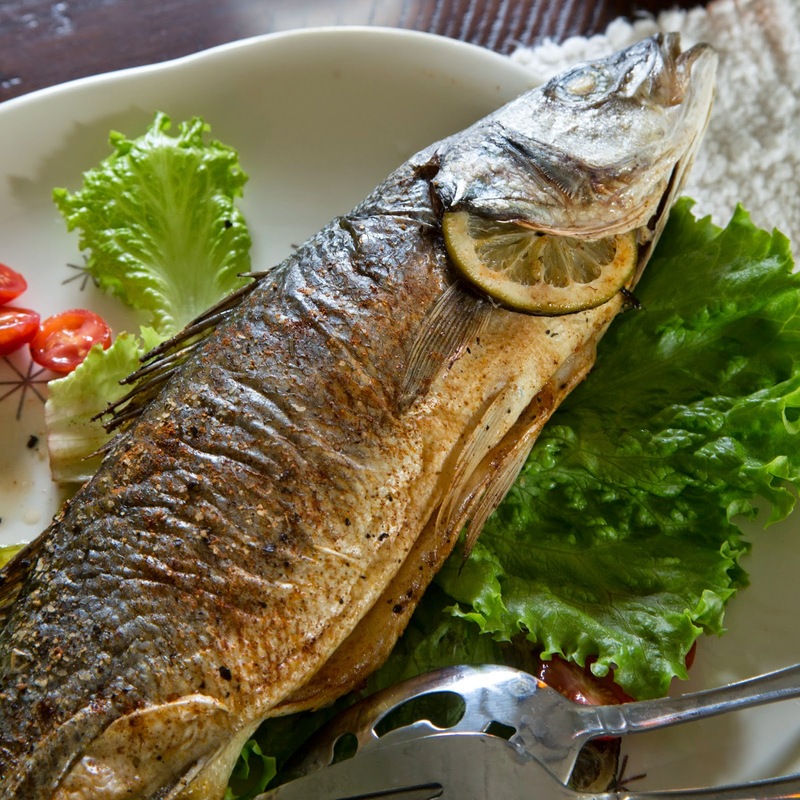 1) Ask for Whole Branzino (or Trout or Sea Bass), then ask them to "Scale and Gut it." 2) Unwrap it at home, rinse the fish and dry well. 3) Season inside/outside with Salt, Pepper and Paprika. Add a few slices of lemon to the inside of the fish. 5) Put the pan into the oven, and THEN preheat to 450F. When the oven is preheated, the citrus is roasted and the oil is hot, carefully place the fish on top of the citrus. 6) Continue Roasting for about 15 minutes (less if the fish is small.) Drizzle White Wine over the fish; continue roasting for 8-10 more minutes. 8) When serving, remove the skin and gently scrape the moist white fish fillet onto a plate. Remove the main bone frame from the middle, then add the bottom fillet to another plate.